[Jesus said,] "I am the living bread that came down from heaven. Anyone who eats this bread will live forever; and this bread, which I will offer so the world may live, is my flesh." Jesus, unlike wheat that has to "die" to be made into flour, is alive. He died and rose again. 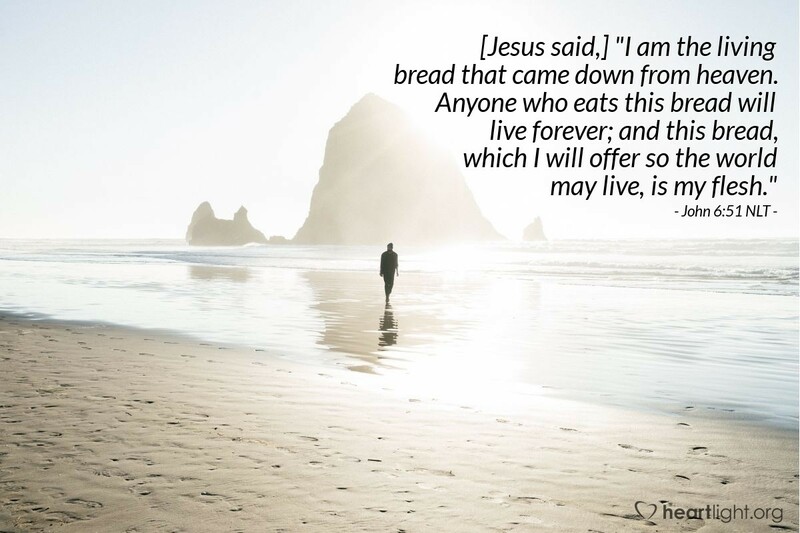 He is "living bread." The gift of his flesh, taken to the cross and sacrificed as a sin offering for us and then raised up on the third day, is offered so that the world can live forever — so that I can live forever! Jesus is the forever bread! Holy and righteous God, thank you for making salvation so accessible in Jesus. Thank you for living in our world, facing our pain, enduring our ridicule, and facing our death. Thank you for the hope that frees me from the fear of death. Thank you for the confidence this hope gives me in my trials. Thank you for giving me the living bread of Jesus, in whose name I pray. Amen.